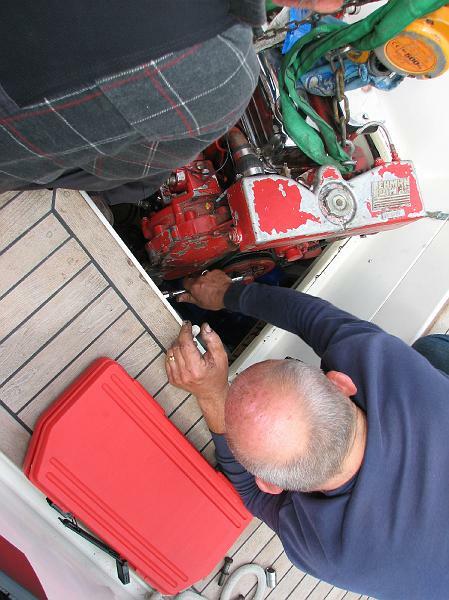 On June 14 as we left the dock at Virtsu, Estonia, the engine transmission stuck in forward. We had no neutral or reverse, both of which are needed when docking a boat. Our plans to cruise in Estonia for two weeks changed; we sailed through the night all the way to Tallinn, Estonia to see if we could get a mechanic to diagnose and repair the problem. This was the third engine problem within a week. Going into Riga we broke the bracket that supports the alternator (generator) on the engine. 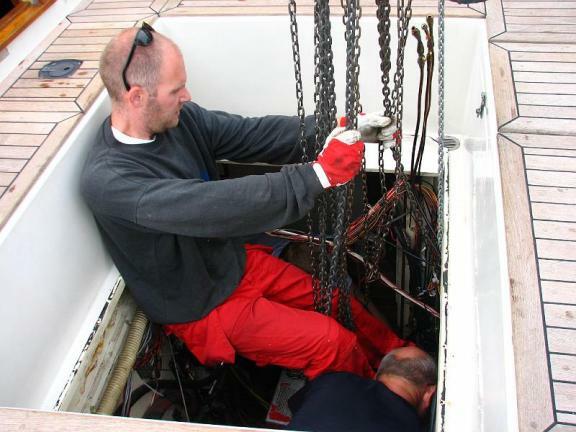 When we got the bracket repaired, Brian noticed that one of the engine mounts was cracked, so we spent an extra 2 days in Riga having a new one fabricated. This third problem in such a short time was frustrating. 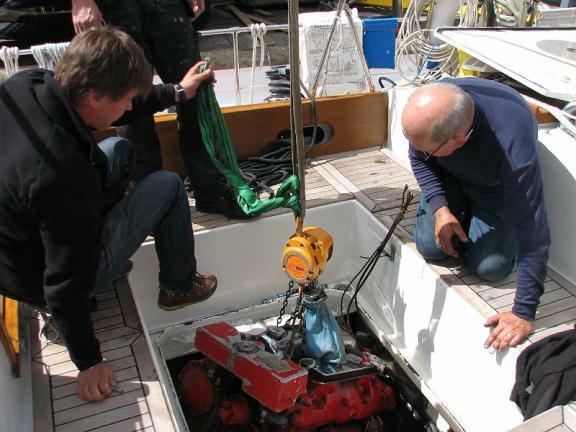 We conjecture the problem started on May 18 when we left Borkum (Germany). The Ems River has a 2-knot ebb current and there was a 25 knot NW wind against the current. The waves became steep as we approached the fairway buoy at which we could turn east. We were still under power when we turned and were hit broadside by an extra-steep (rogue) wave. We “fell” off the 20-foot (7 meter) wave. The boat shuddered. The shock must have started the series of engine problems we experienced. . It is amazing that the transmission kept working for about 100 engine hours in a crippled state. When the transmission was opened bits of gear teeth were discovered. 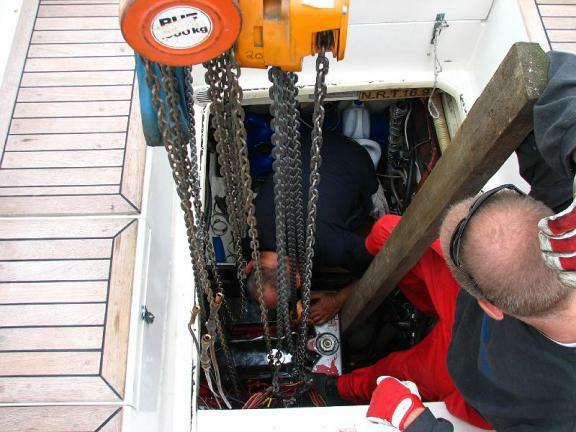 It is assumed that the teeth broke and the broken bits were later carried into the gear mechanism when we were maneuvering to get on and off docks. One piece finally lodged into the gears and locked the transmission into forward gear. We sailed overnight from Virtsu to Tallinn; we were fortunate to have good wind and wind shifts that allowed us to sail right to the harbour at Pirita, the pleasure craft harbour just east of Tallinn. The border control responded to our radio call for help, accompanied us in their inflatable RIB into the harbour behind the break wall, and then towed us safely to their pier. In Pirita, our focus was on getting a mechanic to assess the damage and start work on fixing our engine. After two days waiting to hear if the repair could be done in Estonia, the recommendation was that we sail the boat to Helsinki and have the work coordinated by Leevene, located on Lauttasaari, an island west of downtown Helsinki. We made arrangements to stay at the Helsingfors Segalklubb (HSK), just across the channel from Leevene. Gale-force winds and rain caused yet another day’s delay in our departure. The day we left Estonia began at 2AM when a large Russian powerboat came into the harbour and docked right in front of us. The day before, anticipating we may have difficulty getting off the dock without the use of neutral or reverse, we took a bowline out to a buoy about 55 feet off the dock so that we could pull our bow around into the wind if the wind was holding us on the dock. The only line long enough was our old drogue line, which is black. When the powerboat came in, it probably did not see the line until they were right upon it. The bow thruster was working overtime for quite a few minutes, and of course we were awakened. No damage done and we went back to sleep. Fortunately the wind was blowing us off the dock at 6AM, so we did not need to use it, but getting off the dock was still a bit tricky because the powerboat had backed as close to us as they could, so there was not much swing room. However, we were off the dock at 6:15 and on our way. It took a bit of time to get all the lines stowed and fenders off. One of our fender balls was totally deflated; we were blown onto the dock during a major thunder squall while we were in Pirita, and the fender ball took the brunt of our weight against the dock. The gale force winds had lightened to 12 – 15 knots and backed to the SW, which was perfect for our trip to Helsinki. The sail was glorious. We were trucking along at 7-8 knots much of the way, and arrived at the harbour entrance at 13:00. We encountered about a dozen ferries and cruise ships, but none required us to change course, until we were a couple of miles from Helsinki when a ferry came within ¼ mile and kicked up a 6-foot wake on top of the 3-foot waves. As we neared the harbour we furled the Genoa, turned on the motor and lowered the mainsail. Then the fun began. First, our Estonian cell phone did NOT work in Finland (as many said it would). The only way we had to contact the marina harbour master was by phone. 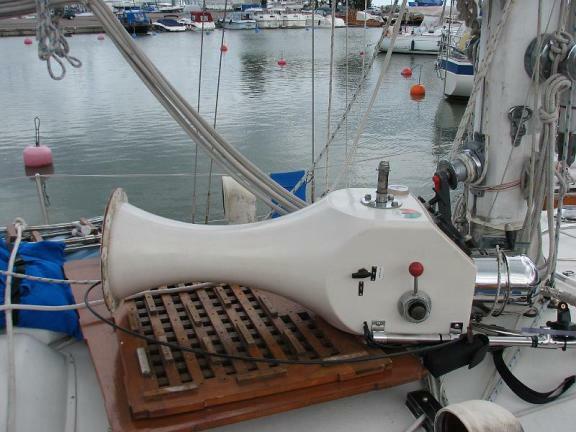 We tried calls on VHF Radio to the marina, then to any boat in the marina, but with no success. Finally we decided we should attempt to anchor. There was a contour with 11-foot depths, and we headed for it. By this time the wind had backed further south and increased to about 20 knots. Even with that much headwind, Pilgrim in forward idle took about 2 minutes to stop. We motored forward a bit more, and then dropped the anchor. We seemed to get a good bite, but since we could not back on the anchor with the motor, we were not sure. We waited, checking our GPS position to ensure we were not drifting. Brian got out the computer to see if he could find a WIFI access point to send an e-mail to the marina or call the harbour master on SKYPE, but we could not get connected. Many boats came in and out of the harbour, but none seemed to think a Canadian sailboat anchored near the harbour entrance was worth investigating. A Finnish Customs boat went into the harbour (and did not respond to our hail on the radio), then came out and circled us. We motioned for help, but they just waved at us and were off. Then we launched the dinghy and Brian rowed into the harbour while Jane kept watch. That is when a Finnish Coast Guard boat went into the harbour without noticing Pilgrim at anchor. 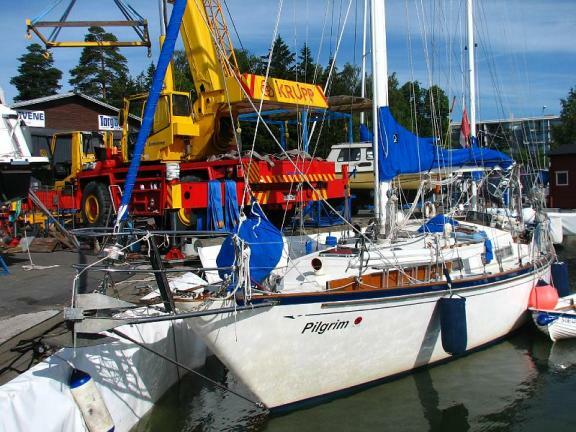 When we were still in Pirita / Tallinn, we had sent e-mails to the manager at Leevene, the company who coordinated the repair, and also to HSK marina where he said we should berth. We wanted to ensure the marina knew we were coming and would need assistance getting in. They had sent us an e-mail back indicating we should call the harbour master, not them, for assistance. 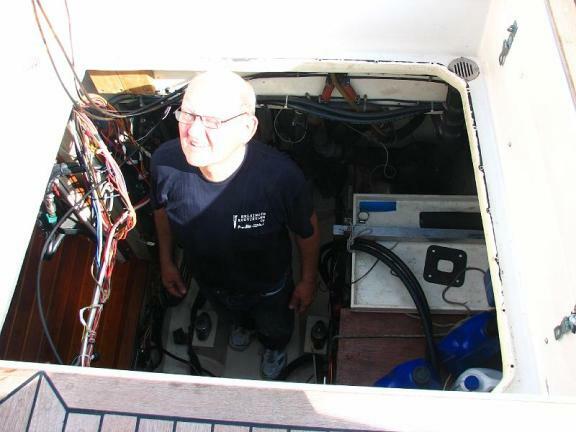 Brian found the HSK marina office tucked way back in the harbour, landed the dinghy and went in to find out about assistance. They were sympathetic, but did not have any idea who could help us. Finally they identified the person who had access to an inflatable and could help us. They phoned him; he agreed to help if we made a donation to the sailing school program. Brian agreed. Pilgrim’s dinghy was left downwind of the mooring space we were assigned, and Brian arrived back at Pilgrim in the sailing school’s large inflatable. The plan was to use Pilgrim’s motor to get into the harbour, towing the inflatable, and then use the inflatable as our reverse when we turned into our mooring space. Our mooring space was not ideal. It required a hard turn, had stern buoys that were only about 60 feet from the quay, and was full of boats. There was little room for error. We turned, but could not turn sharp enough and were still going .5 knots. The wind was blowing us into the quay. We were headed right for the stern of a moored boat; we shut down the engine and hollered REVERSE to the inflatable. Luckily, the wind swept us beyond the stern of the boat, but now we were not in our “assigned” mooring and still going forward. 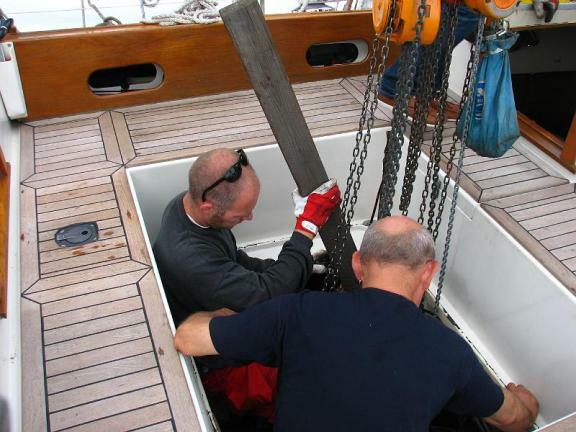 At least we had not mutilated the 27-foot boat that was now on our starboard (right) side instead of our port (left). The inflatable’s reverse was making little impact on our forward speed. We were going to crash into the quay. And that is when we realized there was a SAAB car parked on the quay. Pilgrim’s CQR anchor brushed against its left front fender, and that is what finally slowed our forward progress, protecting our vulnerable bobstay from being mangled by the quay. It took about 20 minutes to get stern and bow lines around 3 stern buoys and two bow rings in the 20 knots of wind blowing our starboard quarter before we could breathe. That is when I noticed that our dinghy was in the mooring spot we had been assigned. Had we actually made the turn into the correct spot, we would have splintered the dinghy. We arrived in Helsinki the day before Midsummer festivities. The entire country was on holiday for a long weekend and there was nothing we could do but wait and be tourists for the next 3 days. 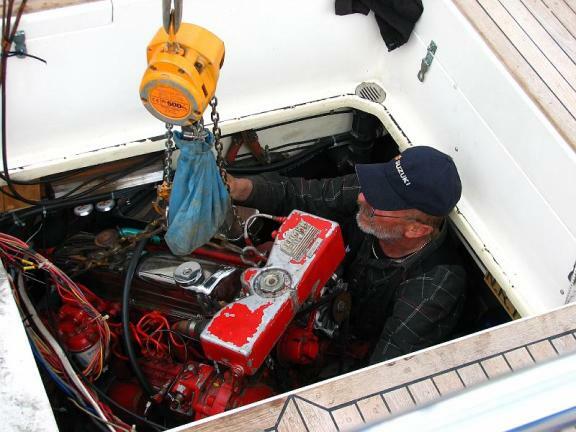 There was no question that the transmission was broken and that to fix it, the engine had to come out of the boat. 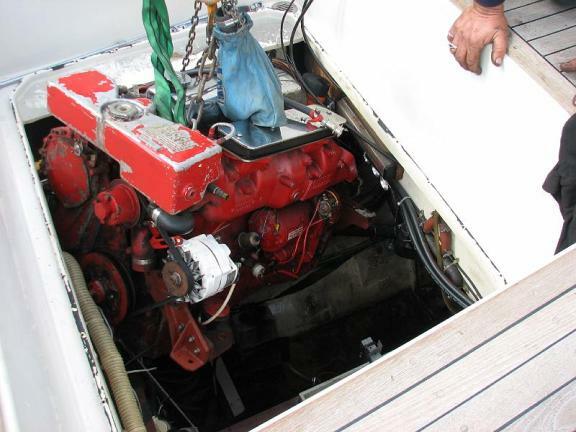 There is not sufficient room to take the transmission off the engine with the engine in the boat. To remove the engine, the pedestal (where the wheel and compass are mounted) had to be removed. 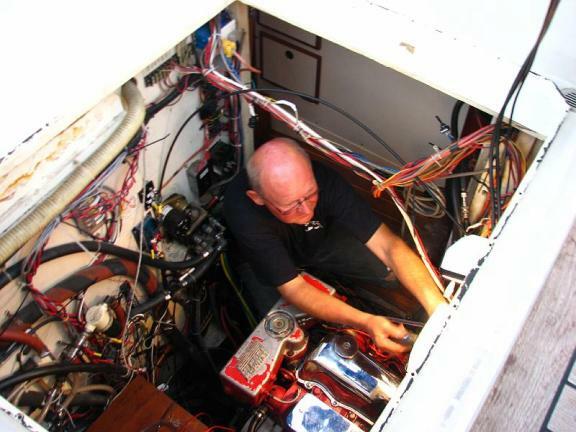 Removing the pedestal entailed disconnecting all the wires to electronic and electric parts of the boat on the pedestal (radar, remote VHF radio microphone, GSP, chart plotter, ignition, fuel tank indicators, oil pressure indicator, tachometer, lights) and the hydraulic steering hoses. We took down our cockpit enclosure before towing the boat across to channel to Leevene’s crane. Then we removed the pedestal, and lifted the cockpit floor to expose the engine to the open air. You may have thought the crane did all the rest of the work, but wrong again. The mechanic had a difficult time removing the engine bolts. Then when the engine was lifted, it did not cleanly clear the lip of the cockpit and had to be nudged and turned. The mechanic used a chain hoist (“chain fall” is the term used in Canada) that was rated at 500kg. 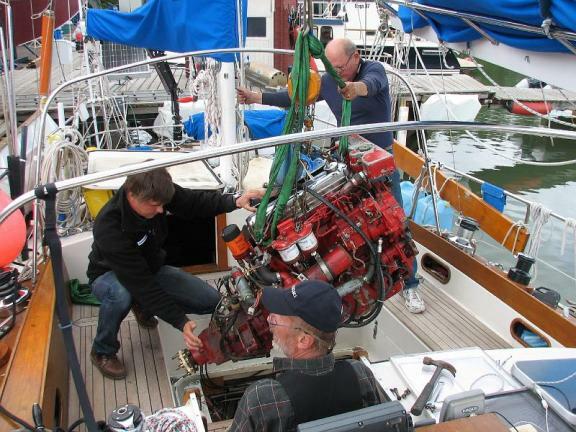 The engine weighs more than that, so we were very nervous until the engine finally came to rest on the skid on the quay. Wonder if it will come out if I take this part off? 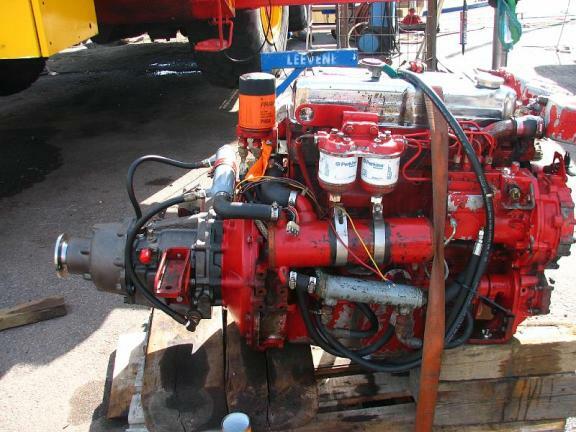 According to a leading expert an engine swap should only take an hour for a Whitby 42 …right …so I guess the 4 days it took me was due to inexperience. 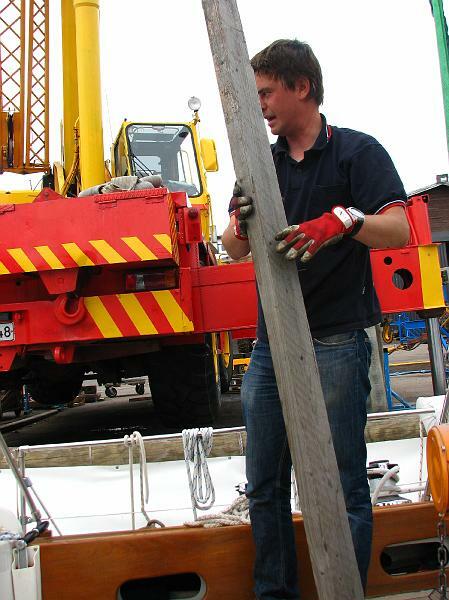 The transmission was removed and shipped to Turku, 200 km away, for problem analysis. Five days later (a weekend intervened) we got the bad news. 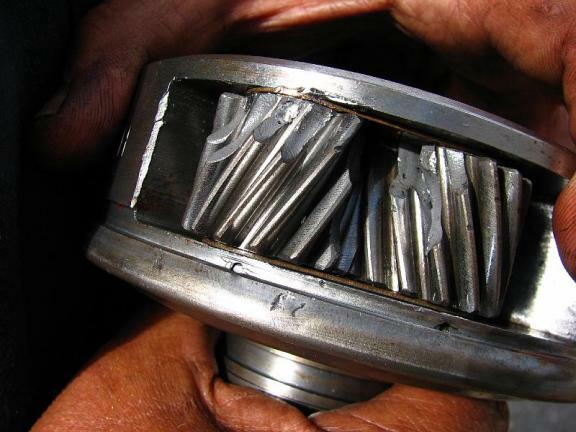 The cost of repairing the transmission would be as much or more than the cost of a new one. The damage was extensive; the most expensive part, a pinion gear, was completely gone. We asked them to order a refurbished unit from the US and have it air-shipped to Helsinki. The transmission manufacturer, Borg Werner, has not been in business for several years. The following day we learned that an exact replacement for our transmission could not be found, and a different model, 100 pounds heavier and 20mm longer, had been ordered. We were unsure what the larger size would mean: the two most likely problems were the length of the prop shaft and the engine mounts. The forward engine mounts are on the engine and the aft mounts are on the transmission. The wait was frustrating, especially since we had no idea of the shipping status. 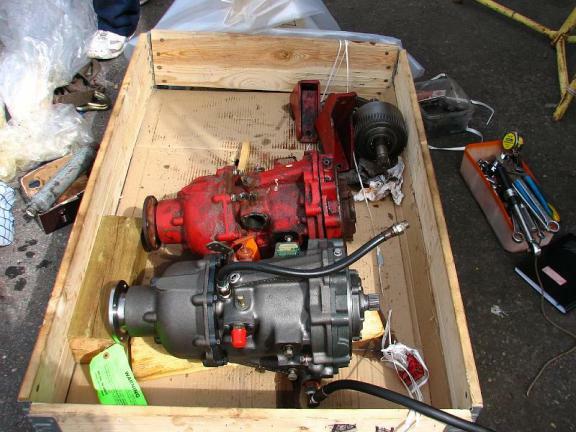 Two weeks after the engine was pulled, the new transmission arrived from the US and the old transmission arrived from Turku. The old and new transmissions … not the same size …oops!